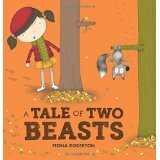 Why I like this book: It’s a great story about not picking on people weaker than you and a reminder that little ones, even kids, can be smart and act kindly. 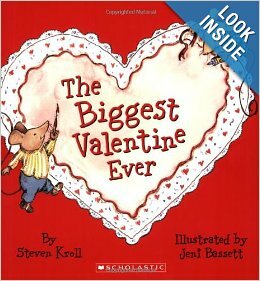 Before reading the story, talk about what kids know about mice and lions – What size are they? What do they like to eat? Are they fierce or mellow, brave or fearful? 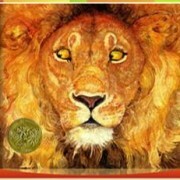 As you read the story, have the kids predict what the lion will do when it catches the mouse. This often can lead to discussions about bullying. 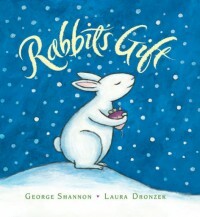 This is a great book to delve into expected and unexpected behaviors and the consequences of each. The lion released the mouse, which freed him, made him happy and resulted in the mouse freeing the lion on another day. This is a great story for dramatic play. With a group of 3 – 5, have the kids take on roles of different small animals such as a mouse, bird, rabbit, or snake. Have them think about and act out how each of those characters might free the lion. Acting out the story creates opportunities for motor play as the kids set up their animal homes and move like various animals. 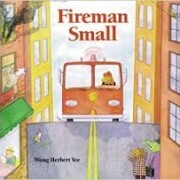 When kids act out this story, they are working on self-regulation. The lion must be careful not to grasp the mouse too hard and when the lion is released from his net, he must figure out how to not struggle too hard. If the motor planning element is too challenging and the kids can’t tell the story while they move, try using finger puppets or making paper bag puppets to use for a puppet show. The best part of the story is that if we help someone, they may come back to help us later, and what a good feeling that is for everyone! There are many MANY renderings of this story. Support books4all and order this book from our Amazon Store where we have added several of our favorite versions. Thank you! 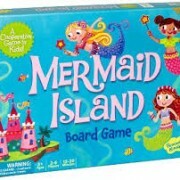 Finding and developing a connection to their own self-identified and self-guided interests. In a local school this week I observed a class of 4 and 5 year olds on the playground. 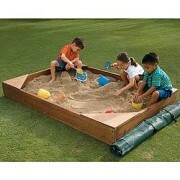 A large sand box with sort of dirty, wet sand elicited the creation of a garden. (Self-identified interest). Kids started digging with play shovels. When shovels ran out and kids started complaining, others offered suggestions to use sticks, wait their turn, dig with hands, or take on another job. (Solving problems). Some kids ran around collecting dirty, dead leaves to plant while others filled toy dump trucks to collect dirt and dump it on the planted seeds. (Making decisions). Kids then started talking about what plants they were growing. Some said flowers, some vegetables. It didn’t seem to matter. (Self-guided interests). When one boy began flinging dirt, the others told him to stop and to dig somewhere else. 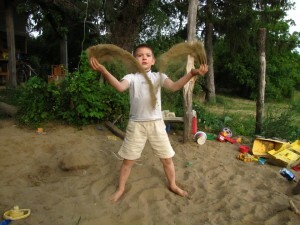 Happily, the child was able to move away and began filling a truck with sand to take to the garden. (Following rules, handling emotions). The sand box was filled with well-organized chaotic play. Boys and girls played together and all seemed to have jobs and ideas. (Getting along with each other). Best of all, they were all happy in their industrious, creative, pretend play. This may seem like a mundane scene that can be found on any playground. However, I wanted to highlight it here because we continue to pressure our schools and families to improve academics and keep up with children in other countries and cultures in math and technology. We also need to let the children play, for within the context of play, kids develop essential skills that enable them to flourish in the global economy. If our kids can learn to discover their self-interests and skills, make decisions and solve problems, self-regulate, handle disappointments, get along with others and find happiness, what more could we ask? Did you know that February is Friendship Month? We didn’t until last week when our friend Tiffani over at Special-ism let us know. For some time now, Meghan, Jill and Karen have taken a hiatus from the online portion of all4mychild. We moved our clinic a couple of years ago and took some time to focus on that. We have missed our online friends, however, and felt that there was no better time to return than in celebration of Friendship Month. We spend every day working with kids to help them feel more socially confident so that their friendship circles can grow. Now we want our online friendships to start growing once again as well. If you don’t already subscribe to our newsletter, you can do so HERE. We are excited to start blogging again, to review more books, to continue to offer special promotions for our APPS and to add more exciting features to our website. We hope you will follow along with us as we once again join this amazing online community of those who love children. Many aspects of life are paradoxical and this is one of the biggies for our socially challenged kids. The children who participate in our Social Adventures Groups earnestly try to be flexible, to “go with the flow”, to try new ideas, or play a game with someone else’s rules, but it is SO very hard! Since that session was a wash, Meghan and I talked about how to follow it up the next week. Do we let Joey draw his own picture to keep the peace or do we push the envelope? The next week, Meghan and I demonstrated again how the activity worked while some of the kids added to Meghan’s picture and some to mine. Then we switched. We talked about the pictures in our heads and how they were all different. We also practiced complimenting each other’s pictures. Last week, the kids were each given 1 minute to change their shape into anything they wanted and would be able to take that picture home. They were then given a second paper with a shape to draw on and switch. This is what Joey did. He was given a figure 8 shape and began turning it into a racetrack by drawing a little car on the side. It was passed to his neighbor, Sam, who turned it into a large pair of eye glasses. When the sharing time arrived, we honestly didn’t know whether Joey would lose it or love it. They were such different kinds of pictures – a racetrack and a pair of glasses! Comments flew around the table that it would be so cool to have a pair of glasses with a racecar on the side. (Joey wears glasses, by the way). We all held our breath until a generous smile emerged on Joey’s face. When it was time to go, he ran to his mother with the picture, delightedly exclaiming that he and his friends invented a new pair of glasses! This story exemplifies one of those balancing act events that everyone who has children in their lives experiences hundreds of times a day. Happily, I think a little peace AND flexibility were achieved in Joey’s mind and heart that day… along with a cool pair of glasses. Check out the Social Adventures App for more activities like this. Description: A little bear wakes from his winter nap and has no one to enjoy the snow with. He decides to build a snowman to play with and meets some friends along the way. 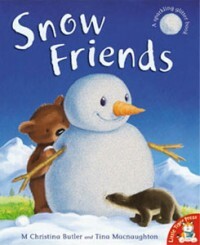 Why I like this story: A cute winter story that encourages friendship and thinking about others. use to discuss setting (woods, cave). Draw a big winter wood scene and have child add the various winter animals to retell the story. Good for description as well as the pictures are textured….sparkly, shiny, white, cold snow. etc. Good for modeling and exposing to “why” questions. Why do they need carrots? Why is the rabbit upset? Why is the bear lonely? etc. Beautiful illustrations for body language and emotions. Have children act out the body language. Good story to act out in a group or dyad . Use big exercise balls to act as snow balls. One child holds the bottom while the others, “make” the other snow ball. Encourage team work and communication as they roll the balls. Discuss friendship and thinking of others. Why did the animals make another snowman? (They didn’t want the snowman to be lonely when they left to do other activities). How can they include others? *Like this review and activities? 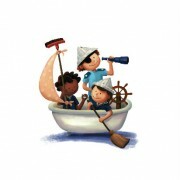 Check out the Social Adventures App, available on the , for more activities for children.